A mini-exhibition about the life and legacy of the Paisley-born Communist MP and life-long left-wing radical Willie Gallacher is now open at the Heritage Centre within Paisley Central Library; marking the 50thanniversary of his funeral on 21 August 1965. Born and brought up in Paisley, Willie Gallacher began his career in politics with the Independent Labour Party before joining the Social Democratic Federation. 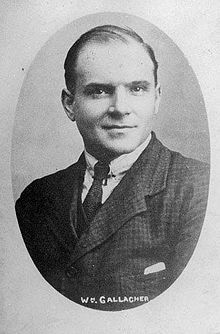 In 1920, he helped form the Communist Party of Great Britain and was one of only 3 Communist MPs to serve in the House of Commons (as MP for West Fife 1935 – 1950). Gallacher was also a member of the Clyde Workers’ Committee and was involved in the world-famous ‘Red Clydeside’ rally in George Square in 1919, where approximately 90000 turned out to campaign for a 40 hour week and better conditions for Clydeside workers after the First World War. The rally was perceived as a potential uprising and was broken up by police with members of the CWC and other trade union leaders arrested for attempting to incite a riot. Gallacher was imprisoned for 5 months. When Willie Gallacher died on 16 August 1965, tens of thousands of local people lined the streets of Paisley to pay their respects. Footage from Gallacher’s funeral procession from the Scottish Screen Archive will be shown at the mini-exhibition, alongside newspaper extracts of the day, a scrap book of his later life, books penned by Gallacher over the course of his political career and a bronze bust created by the renowned Soviet Russian sculptor, Evgeny Yuchetich. The exhibition will run until 19 September at the Heritage Centre and admission is free.